July 13-14 marked the 37th WOAL Championships. 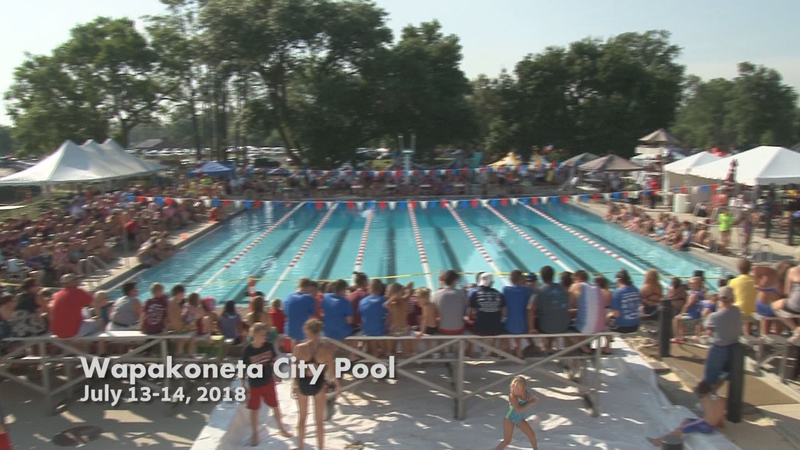 The Wapakoneta Community Pool became a battle zone, as more than 550 swimmers attacked the water, vying to swim their best races of the season. But the activity involved far more than just the swimmers. Parents cheered; parents timed; parents did the announcements; in short, parents almost did it all, except the swimming. The WOAL Summer Swim Program is a highly organized, reputable organization that provides kids ages 4-18 a fun yet educational chance to improve their swimming skills. It’s run by volunteers, most of them parents of swimmers, or parents of graduated swimmers. Parents take classes to become certified officials. They are the timers at the races. And in many cases, they are also the team coaches. The Western Ohio Aquatics League is a family focused and family run organization. The summer swim season in northwest Ohio typically starts right before Memorial Day, and runs through the middle of July. 7 weeks of daily swim practices, bi-weekly dual swim meets, pancake breakfasts, swim ribbons, and during some years, too many cancellations due to rain. But this is a league that’s about more than just racing; it’s also a league that gives back. 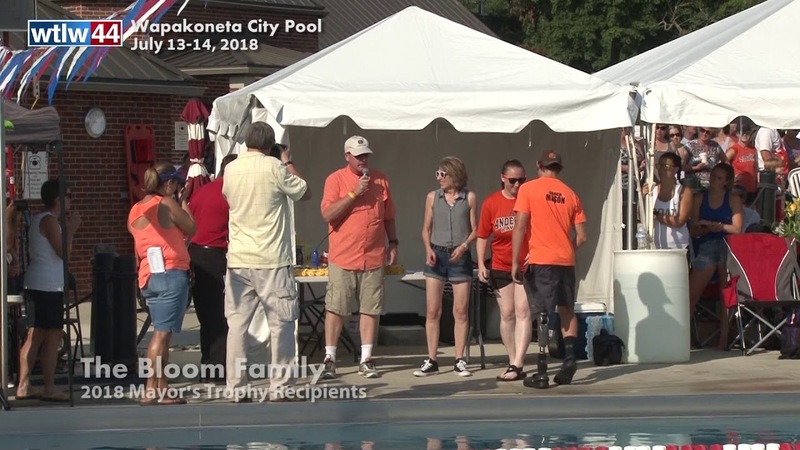 Every year, at the championship meet, the mayor of the host city greets the attendees, and then the mayor’s trophy is presented. 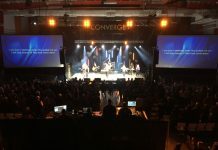 Two recipients were honored with the award this year: a family and an individual: The Bloom family of Kenton, and Jennifer Patterson of Shawnee. Also special to this 2-day event: a fun, creative kick off parade, during which each team selects a unique theme. 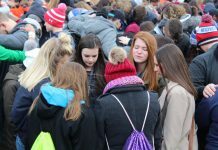 Seniors from the previous school year are honored, and at the end of day 2, The Memorial Relay takes place, a relay race during which swimmers swim in memory of loved ones who passed away the previous year. The Elks Lodge 54 (Lima) is the sponsor of the event, and their faithful volunteers can be found at the medal stand, presenting the top six awards after each of the races. Ada, Kenton, Wapakoneta, Van Wert, and Bluffton, Shawnee Country Club, Sherwood Park Community Club, and Westside Swim and Racket Club, that’s the West Ohio Aquatics League. This year Westside took first place at the two day event. Wapak second. And Bluffton third. 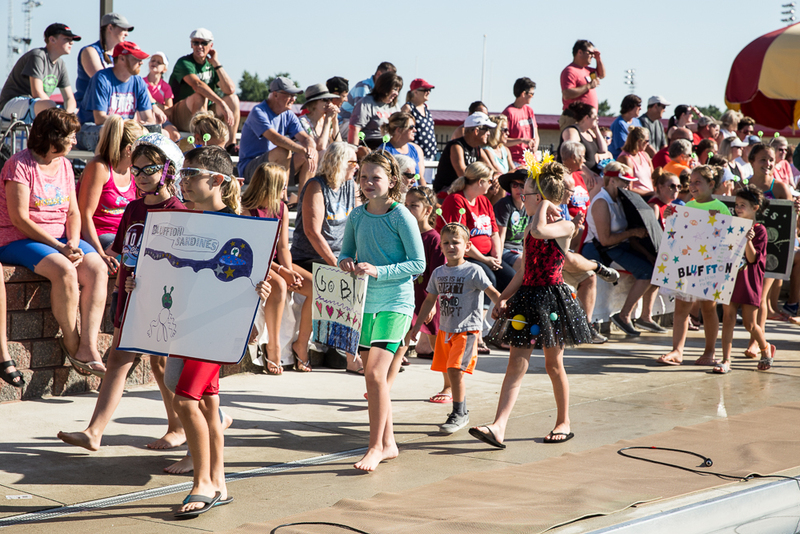 And while the finish is important to these swimmers and coaches, the bigger message of goal setting, teamwork, thinking of others, swimming for a purpose, and finding a way to have competitive fun in the outdoor summer sun makes the WOAL swim league truly in a league of its own.